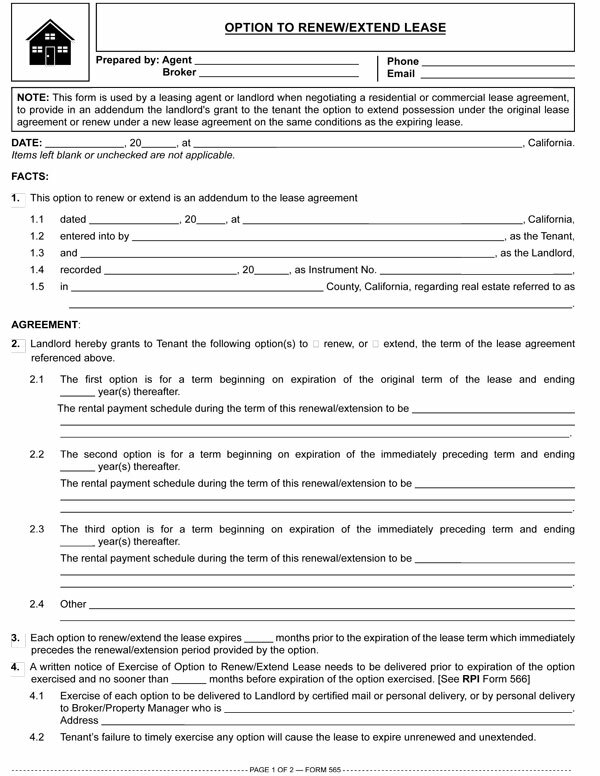 This form is used by a leasing agent or landlord when negotiating a residential or commercial lease agreement, to provide in an addendum the landlord’s grant to the tenant the option to extend possession under the original lease agreement or renew under a new lease agreement on the same conditions as the expiring lease. the premises is not what they need for the future and, being under no obligation to exercise the option, they are to vacate the premises on expiration of the lease. The landlord also benefits from an option to renew/extend. A renewal option encourages a tenant to enter into the lease since it affords the tenant has the right to continue in possession if the property proves beneficial to their business. Additionally, the renewal/extension option encourages improvements and promotion of the location by the tenant in anticipation of being able to remain in possession. Thus, the option is both an inducement to let and an inducement to stay. A technical, but very critical, distinction exists between the renewal andextension of a lease. An extension stretches out of the original lease term while retaining all aspects and conditions created by the original lease agreement. On exercise of the option to extend, the original termination date for vacating stated in the lease agreement is modified as provided in the option provisions, extending the term for the additional period. A renewal involves the preparation and signing of a new lease which creates an entirely new and thus different tenancy. The new tenancy is subject to any change in law affecting the rights and obligations of the landlord or the tenant since entering into the original lease agreement. More importantly, the new lease is subordinate to any encumbrances — mortgages, judgments or tax liens — which the landlord caused to be recorded during the term of the prior lease. This creates a precarious situation for the tenant since the landlord can give others rights which have priority over the new lease agreement — rights to the property sandwiched into title between the landlord’s fee rights and the tenant’s rights to occupancy. Quite often, however, everyone involved carelessly uses the terms interchangeably. In doing so, they neglect to maintain clarity of purpose, legal rights and the paperwork involved. Usually, the tenant is required to give written notice of their exercise of the option several months before the current term of the lease expires — typically a period of time ending three to six months before expiration of the original lease. Advance notice requirements give the landlord ample time to locate a new tenant if the present tenant elects not to renew/extend the lease. The Exercise of Option to Renew/Extend Lease form provides the tenant with the paperwork needed to exercise the option. Editor’s note — Another step or activity may be called for in the option which is requisite to the exercise of the option, such as the landlord requiring a substantial renovation of the leased premises in a certain year as a condition to exercising the option to renew. If such an activity or step is required, it needs to be performed or properly addressed in the form used to exercise the option. A leasing agent who negotiates an option to renew or extend on behalf of a tenant needs to consider arranging for the inclusion of a notice provision in the option that requires the landlord to give the tenant notice of the option’s expiration 60 to 180 days prior to the expiration of the option period for exercise. This notice from the landlord to the tenant of expiration of the option eliminates the element of surprise for both the landlord and tenant. The tenant’s inadvertent failure to exercise the lease renewal option can prove disastrous for the tenant who plans to continue in occupancy after the expiration of the original lease term. If the landlord will re-rent the premises to the existing tenant despite the tenant’s failure to exercise a renewal/extension option, the tenant will be forced to negotiate the terms of a new lease under the then existing market conditions. Thus, the landlord may be in a position, if availability of space has become extremely tight, to take unconscionable advantage of the tenant, an over-reach situation the landlord is to be careful to avoid. Form navigation page published 02-2016.